The iconic Elliot Counter Stool combines clean lines with classic vernacular. 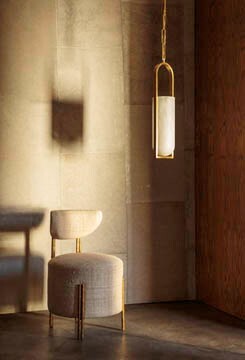 This upholstered stool features paired brass bar-stock legs finished in either a Burnished Brass or Oil Rubbed Brass finish. The seat is available in a selection of curated fabrics and leathers. The iconic Elliot Bar Stool combines clean lines with classic vernacular. This upholstered stool features paired brass bar-stock legs finished in either a Burnished Brass or Oil Rubbed Brass finish. The seat is available in a selection of curated fabrics and leathers. The iconic Elliot Chair combines clean lines with classic vernacular. This dining or occasional chair features paired brass bar-stock legs finished in either a Burnished Brass or Oil Rubbed Brass finish. The seat is available in a selection of curated fabrics and leathers. The clean, architectural lines and casual sensability of the Zuma Chair make this dining option a modern classic. The bent Oak frame with its sweeping curves comes in an Ebonized or Bleached finish with thoughtful brass detailing. The tightly upholstered seat back wraps trimly around the frame and the boxed seat has a self-welt detail. The underside of the seat features our Kelly Wearstler badging and a unique artfully printed dust cover. These perfectly proportioned chairs are crafted in our Los Angeles workshop and are available in a curated selection of leathers.